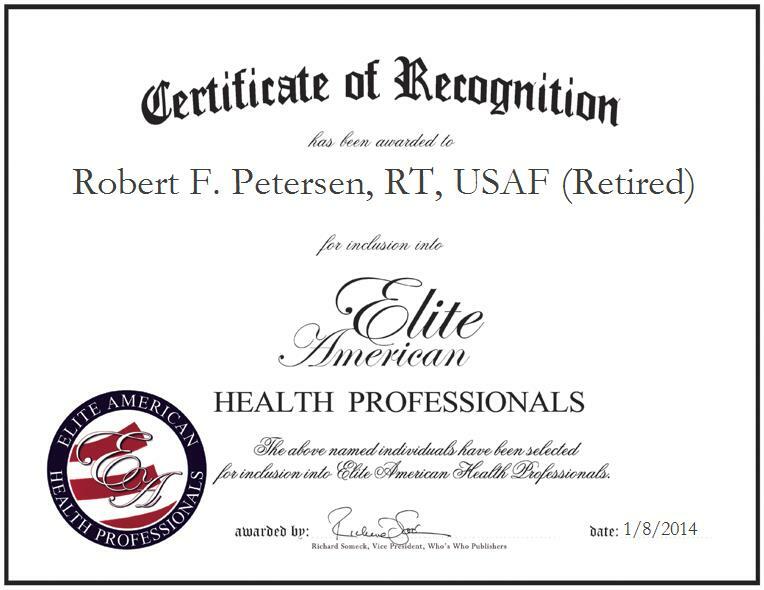 BANGOR, ME, January 8, 2014, Robert F. Petersen, RT, USAF (Retired), Radiology Staff Technologist at St. Joseph Hospital, has been recognized by Elite American Health Professionals for dedication, achievements and leadership in radiology services.Mr. Petersen always had an interest in the medical field and got hands on experience while in the Air Force. He served his country for 20 years as a radiology technologist before retiring and deciding to continue his career in health care. He joined St. Joseph Hospital 22 years ago and has become an integral part of its success. In his role, Mr. Petersen is responsible for overseeing staff and technicians in the radiology department. Throughout his career, Mr. Petersen has been involved in radiographing victims of plane crashes and people who wanted to find the cause of their pain. He has gained the respect of his colleagues and patients for his quality of work and genuine desire to make them feel better.Mr. Petersen is a nationally registered radiological technician and completed coursework and training through the Air Force. He attended the Non-Commissioned Officer Academy and International Ultrasound Institute. He keeps abreast of changes in his field through his affiliation with the American Society of Radiologic Technologists. A highly decorated professional, Mr. Petersen attributes all the success he experienced throughout his career to his ability to utilize the opportunities that came his way and to the support he receives from his mentors.